No. 1002: Is Jan Hanvold, Jan Aage Torp and others who are re-married as "believers" a child of God or the Devil's children? What font? Is Jan Hanvold, Jan Aage Torp and others who are re-married as "believers" a child of God or the Devil's children? What font? I see you write about Jan Hanvold, Jan Aage Torp etc .. You mean they are a child of God or a devil's child? 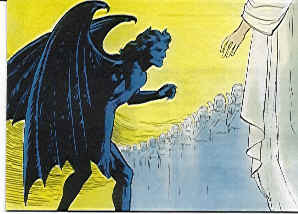 Image of Satan who is the spiritual source of all living in open sin and confess Jesus' name, and thus also their Father. Thank you for a very interesting question Waldemar. Let's firstly see if they are re-married as believers can call themselves a Christian? That's what it's all about! He has been separated as a Christian. He thus has two choices scripture says. Whether to reconcile himself with his first wife and correct, or live single. Believes these that they are entitled to live as they wish, want and think is right? Here is not the word of God is crucial, but what they and other people even feel. We can thus affirm right away that these are not true believers, then it is only and alone the word of God that decides everything that comes to our lives. These are then not a child of God, but the opposite than that. What are they then? Scripture says that the spiritual area so we are either children of God or the Devil's child. Either we are under the grace of God with our lives or God's wrath. These are then under the wrath of God for their lives and for the words of Scripture a devil child. Either we are Children of light, or the children of wrath. Either we are children of God or children of Satan. Either we placed in God's Beloved Son rich or rich to the Dark Prince. Where does it Hanvold home? He is obviously not the children of God, a Light children or live in God's Beloved Son rich when he lives according to their own lusts, being ruled by his flesh and tread the word of God under their feet. Then he a devil child, under the wrath of God is in this world and the Dark Prince's iron grip on his life when he hears him! Harsh words? Yes, but this is what God's word teaches! Example. lots of good deeds outweigh unsettled or unresolved sin? No matter how much "good" those who are re-married do, it has no positive meaning. On the contrary, it is to ask for mercy and put themselves on the last bench. It is preferable to put themselves on the first straight and go up on the podium. The person who is re-married are living dead, and by writing words on its way towards perdition. Of course this is painful to hear, and needed to preach even though it goes against our human and human emotions. There is only one thing that is good in the past. It is to emphasize God's faithfulness, we can "change" out all the negative with the positive and that builds up. That all things work together for good to love God and His Word! I grew up in a Christian home, was from a violent pneumonia in six years of age very strongly attacked by asthma and bronchitis and had a lot of absences from school. When the work God often with me, when I so "was taken remoteness" in childhood and adolescence. But as soon as the attacks were over, I would 'compensate' for my weaknesses, "show me" on some area, catch up with the others. Then God again in the distance. To make a long story short: I was married, had our first child and began about 30 years old a demanding education next to work. When stopped God me up. The reason was that my parents and others were praying for me to God that he would overtake me. So we decided, my wife and I, to become Christians, gave us over to God, and would truly and seriously be Bible-believing Christians. I testified, was ia leader of the local Christian school team, and was eventually asked to preach, even beyond the community. I was not then of course almost certainly a Christian? Yes, it was neither I nor others there slightest doubt - although I probably, like everyone else, once in a while, when I had done something that was clearly sin could come into doubt how I was with God. So after several years there was a young friend who asked if we two could have a prayer time early New Year's supper afternoon. When we got together, he asked: "What shall we ask for the new year?" I replied, "I think we'll bend our knees and ask God to show us there too!" There, as we prayed, God showed me that I had to ask to "get obviously more of the Gospel of the Son of God"! The Gospel, which I had testified and preached about, I had therefore now ask God reveal "more of" for me! I started there and then, and continued course to ask for this. And so, after two to three weeks, God began, little by little, to reveal the gospel of the Son of God for me. I had never before seen the gospel! Now I was born again! Something I therefore in all my "conservative Bible-believing" Christianity had not been! But here I must immediately get interject something, so that God did speak to me not to be perceived incorrectly. The very serious in this, a warning to all people, is how fast we sit in our own view that "we are then in any case saved." The side of the case, it somehow never any doubt - even though we once in a while can be a bit distressed when we have done something wrong, fell into a sin. When disturbed, we occasionally in question whether we have it right with God. But we strive enough to ask God to show us whether we "need more of" something spiritually positive, but not to pray like David: "Search me, O God, and know my heart; Try me and know my motives! See if there be any wicked way! ', 139: 23-24. That means, that it is so bad, no to, unless God has first processed them by his Holy Spirit. Therefore set I also saw firm in my conviction that I had enough in order with God, knew the good news etc. So God could not at all come to with me with some admonition to simply request "to see the gospel" . For that, I had the testified, preached and believed I really "could well". And therefore I perceived his message to me just like that I had to ask to "see more of the Gospel of the Son of God!" But when I saw prayed about it and God, who in His mercy always encounters sinners in the "cloak" their location, heard my prayer and revealed the gospel of the Son of God for me - and gave birth to me again !, I understood the once that I had never seen the gospel of the Son of God before, was not born again! Be aware that this may be just your thing! In John 3: 6, we see Jesus says: "That which is born of the flesh is flesh"
Let's be clear about, many unfortunately do not reflect upon, that every human from our natural birth is "by nature children of wrath," Ephesians 2: 3. Which is just another word for "devil", John 8:44, 1 John 3: 8-10. Therefore, it is we as soon as possible carry our children to Christ in baptism. Luke 6:16 p.m. is sometimes misinterpreted. It says: "Jesus called them together and said, Suffer little children to come unto me and forbid them not, for the kingdom of God belongs to such!". It's the last words, "for the kingdom of God belongs to such as" perceived that the young children from birth belongs the kingdom of God, therefore God's children. But it is not this Bible's meaning. The text says that "the kingdom of God belongs to such as," not that "such (kids) kingdom of God." In other words, Jesus said, Suffer little children to come unto me, for the kingdom of God is precisely for such (conf . : Matthew 18: 3. "Verily I say unto you, Except ye be converted, and become as little children, ye shall not enter into the Kingdom of Heaven "). About this scripture should be interpreted as kids kingdom of God, therefore God's children from birth, would the also be in strong conflict with God's clear word in many places, for example. "Rooms 5:18," somehow one man's offense was condemnation for all men, so also becomes one man's act of righteousness justification of life of all men ". Jesus speaks to those "who had believed in him": "If ye continue in my word .... ye shall know the truth, and the truth shall make you free". When they react strongly, showing that they have enough with that they "are sons of Abraham and have never been anyone's slaves." So Jesus says: "You have your father the devil, and you do deeds of your father," John 8:44. So they are not yet born again! Therefore, it is Jesus urges them to "be in my word" so they can "know the truth, and the truth shall make you free", ie feed them again. For from Scripture happens this new birth clearly God's Word and Spirit: "To you is born again, not of corruptible but of incorruptible, by the word of God, which liveth and abideth .... But word of the Lord endures forever . And this is the word which has been preached to you the gospel, "1 Peter 1: 23.25. The new birth is a clear parallel to a bodily conception and birth: When God's seed, gospel, by God's Holy Spirit meetings and occupies our heart, so it creates new life, Life in the Son of God. For "God has given us eternal life, and this life is in his Son. Whoever has the Son has life. Whoever does not have the Son of God hath not life. " 1 John 5: 11-12. "Notice the word apostle first and last mention that man's natural state (Ephesians 2 v.1 and 5) - the short, talkative word: dead - dead in trespasses. This is the deep, accident saturated word about the syndefallets result: "When you eat of it you shall surely die", 1MOS 2:17. Life seemed of God is gone - the man is spiritually a corpse. Christ speaks even so when he Mat 8:22 says, "Let the dead bury their dead." Many people find it hard voice that does not have the meaning as death usually have. But Christ the Lord uses a very marked expression, and we see in the Bible the word we last quoted, he juxtaposes the corporeal and the spiritual death that two kinds of corpses. The physical death is characterized in that the dead do not respond to anything. He does not see, do not hear, do not know anything, besides that he has not the faintest respiration. All this despite the fact that he still has all the organs, eyes, ears, mouth and lungs - just like a living person. Is not it just as well with the spiritually dead? They may have a good sense, a sensitive heart, a lot of knowledge, noble attitudes to life, good and merciful deeds, -. But life in Christ - that's just what they lack, to be united with God. They see, hear, think and feel very strongly all that belongs to the earthy and sensuous, but "does not accept the things of the Spirit of God," 1 Corinthians 2:14. They read, hear, understand and believe in a sense of God's word. Yes, they can also read and hear God settled the judge of its own state -. And yet remain completely quiet and unspoiled. It is precisely that of a corpse where it does not even exist respiration. " So far Rosenius. Can you imagine anything greater deception? Yes, what is a Pharisee? I formulate it yourself like this: There is a man who with all his heart conviction goes in, live by and fight for something he - without knowing it - yet they are not! Way I was! Are you born again? Do you have life in the Son of God? Let us look at some of the first families we get closer knowledge of the Bible. First there was Adam and Eve with their two sons; Cain and Abel. Adam and Eve were not only parents, they were also teachers for their two sons. Think for a living portrayal these Bible's first parents had to share with sons! First life with God, completely open and warm communion with him, where Adam was all mankind first deputy before God. So, the fall that took all humanity into the judgment, and that totally transformed Adam and Eve to God. Now they fled for God hid from him, lied to him, blamed each other - and ultimately in God, that they fell -! And so, in their guilt conscious state, God comes to them. They await death sentence - for he had said that if they sinned, they would "surely die"! But God comes, preaching to them the earthly result of the fall, but let them stand and hear him preach to hose their perfect life: the Gospel that "seed of the woman shall bruise the serpent's head." So they have learned and practiced with his two sons to sacrifice a sacrifice to God for him to come, "the woman's seed," the second deputy, for the salvation of all mankind. This sacred sacrificial action has both Cain and Abel learned, rejoiced to attend, and often self-willed continue. But then, in 2Mos 4, revealed suddenly evighetsalvoret the difference between these two brothers. Abel offered a sacrifice that he took of the firstborn lambs in the herd, while Cain thought it was okay that he carried to the Lord an offering of the fruits - only it had the same value as Abel's sacrifice. He had never seen the heavenly message of salvation in that there should be a lamb, a first born lambs! And thus never passed the contents of the message offered a sacrifice for! Then we have another one of the first families Bible mentions Isaac and Rebekah his sons Esau and Jacob. Esau was born to inheritance. But we'll see mom helps James to make himself equal to his brother Esau, to usurp his birthright face of danger. Esau was hairy all over. So mom let rails of kjeene Jacob had slaughtered about the visible and tangible of his body; around the wrists and the smooth part of the neck. When he came to his father, who was now old and almost blind, spoke to Isaac to him, felt his body, saying: "The voice is Jacob, but the hands are Esau!" Jacob usurped by the birthright. This is a strong image of how people throughout the ages have tried to "usurp the birthright," salvation by works, which I had "decided to become a Christian, gave me over to God." Or as Jacob: Hiding behind seeming testimony of something we are - when we are not, for example. a chain with a cross around her neck m.m.m. - To show that we are Christians, or in any way possible trades, are involved as "active Christians" in "the established Christendom", and through prayer, Bible knowledge, etc., "That we might have a name to live ..." but can nevertheless be dead, Rev. 3: 1. If we so take for us some of the many cases of people in the Bible that speaks specifically about this, begins urgency to step up for us. There was a Cornelius: "He was a devout man, and feared God with all his house. He gave much alms to the people and prayed to God, "Acts 10: 2. He lived thus a far more biblical life than even many of the most prominent in today's Christianity stands for. Who could believe other than that he really had his right with God? But one day an angel of God and says he will call to Peter, and "he shall speak words to you that you will be saved, you and all your house," said the angel, Acts 11:14. He was therefore not saved! So we can mention Saul, who could testify that he was "under the law blameless" - until Jesus met him and he was saved! Then we have the man who had fought his way through the temptations which prevented the others to reach the wedding hall; some were busy with their fields, some of the animals they had acquired, and some with their spouse. But this man was thus reached the wedding. Then comes the king in and see that the man lacks wedding clothes! Was therefore not saved! And then reads the verdict: "The king said to the servants, Bind him hand and foot and cast him into the outer darkness! There will be weeping and gnashing of teeth. For many are called, but few are chosen, "Matt 22: 13-14. Many are called but few are chosen, called it! That does not mean there are few that God will save. No, God has chosen us in Christ - chosen Christ instead of all the people, that he was entirely lost. He took other words, "Christ instead" all of us together! God speaks from the cloud, "This is my beloved Son." There is thus only one chosen: Christ! And whoever is in Christ, owner then also all his, and is also selected! Many are therefore those whom God calls, perhaps both one and several times in life. But few are those who allow themselves salvation and sharing in the election! There are also many examples of people in the past and now, which has been serious professing "Christians", but has been met by God and born again. We can mention Luther, Rosenius, Øivind Andersen etc. And think: I, Hermod Hogganvik, "was dead and is alive"! Luke 3:32 p.m. Imagine a person who really had been physically dead and then became alive! Would not this be so very for those who were "alive" and for everyone who knew him, that both he himself and everyone else was talking about it? But is not one who is spiritually dead and then alive, born again and given eternal life, a much larger under, and an infinity under - and thus still much more to praise God and to the Lamb for, and to testify ?! Should I not loving distress for my fellow human beings, whether they are known or unknown, shout out my experience, my warning? You do not know it! Exactly as Laodikeamenigheten: "You say I am rich, I have abundance and have need of nothing - and you do not know that you are wretched and miserable and poor and blind and naked," Rev. 3:17. You testify how "rich" you are; you were woken up, you decided to become a Christian, has been with the church, mission, read the Bible, pray, is in the choir, etc.. You "has no need"! While the truth is that "you are wretched and miserable," spiritual "blind and naked", has nothing to keep voted holder to God. And you do not know it! Before God can get greeted you with the gospel, you must be a sinner! He only came to save sinners! Let therefore the word of God get judge you, ask him to reveal to you your total lost state, "give the Lord God, honor and glory .." and acknowledge to God and yourself the sins you are! ", Jos 7:19. And pray that God will reveal the gospel of his Son for you! We will come closer to the end. But then comes the particularly thorny issue, which is also a great need for me: Where you are born again, finding fellowship with God's people? When you are aroused, become "a seeker" or born again, and thus have life in the Son of God, it also created an urge in you to seek God's people. When searching the vast majority - naturally enough - to assemblies that carry Christendom names and symbols, "church", "chapeau" or other names we know means that there is the people of God gather. But what is the state today? Let us have a look beyond "fields" and see what happens in the "field"! We have a terrible condition in Scandinavian countries, which God in His mercy so many a time previously set with revival. Our country putrefied morally. But the root of it is the state of "the established Christianity." The old saying, "A country gets the government of God's people" want "," To a watchful Christian people who see a spiritual maturity, the Bible has strong promises. In 2 Chronicles 7: 13-14 we read: "When I shut up heaven ..... and if I send pestilence among my people, if my people, who are called by My name humble themselves and pray and seek my face and repent of their wicked ways, then will I hear from heaven and forgive their sin and heal their land. " But "Where is faith fire?" What happened? The thing is that after the last World War, across Europe has been a trend that when God's people should fries out of Egypt: "It went well with them a large, mixed crowd," 2Mos 24:38. Of the world, seeking and professing Christians, but not born again, has entered both in the major denominations and lekmannsvirksomheten; Mission companies - as well in the Lutheran and non-Lutheran congregations. So the trend has continued at a high pace; those who have come in have become more and more, have been others, which are not born again. In all decisions to be taken, where individual members will provide input or cast votes, considering these obviously solely on their u-born state, thus only from the natural man judgment. "A natural (ugjenfødte) man receiveth not the things of the Spirit of God. For it is foolishness to him ... it can only spiritually discerned "1 Corinthians 2:14. It's just this world value measurement of these u-born people have to apply in assembly decisions about the use of instruments in church and missionary work. Pretty soon, this world's spirit prevailed both in churches and around the laity meetings, through these u-born, like so as time went on, of course, chose the "her" also in assembly boards and councils. So we now already some years ago - although eventually; first in the most liberal Christian organizations, so in the smaller liberal and finally in the past most conservative, Bible-believing - has come to mean that there is reason to assume that in quite substantially churches and laity organizations - though not everywhere by a unanimous, then at least with a majority of directors or council members - now led "of this world." These are then those who add all of its managers and employees, as well as preachers and missionaries! What else can result in than the election of instruments, procedures and preaching accepted by this world ?! But it is absolutely essential, as are enough signs of apostasy, that is the question: "Are you born again - and have life in God?" Is not preached in the congregations today! When not absolutely essential and crucial issue being raised and an evaluation, it goes without saying that there is substantially lacking, there is no help available to a searching soul, or one who is born again. On the contrary dishes preaching itself today against a crowd where everyone is saved, and live in and by the Word. Ecclesiastes closes therefore, consciously or unconsciously, the eyes of today's spiritual condition. Or "know" he must talk like that -! Then of course the other development in the assembly of far less significance. But if we are to see this yet clearer, we should also look at it. If you have not closed my eyes and refused to see the truth, you had to notice the numerous signs that it is this spirit of the world which has taken over the management of churches and organizations where these things we have mentioned, has been developing itself. 1: Those who for many years has been elected to lead within Christendom boards and councils, are those who are "successful" in this world's eyes. It's about making getting into those "who can." In the affairs of government elected people with solid business education, administrative background, as "the word of his power," etc., That someone from the education, employment or position in society may be considered skilled. While God's Word says that God "chooses things which are not." Paul says: "When I am weak, then I am strong." 2: The clearest sign of verdsliggjørelsen in the chapels is that diploma is and prayer meetings, where the believers, without any preacher, came together, shared the Word that God had revealed to the individual, and asked, has fallen away completely. In some places it is replaced with bible study groups, which often are discussion groups where shared only human thoughts on Scripture secrets. 3: Bede Houses rearranged to party- and banquet facilities. Think of all that which occurs when the riser and this world celebration speech formulations, which is not of God, but rather the opposite -! 4: Bible schools use many different worlds inducements when they announce new seminars, both in the school plan, for example. "Bible and sport", "Bible and .... (many other). And it tempted with that: "It will turn into ... (remove mission countries). 5: Bible schools "decide" that they will gather ... (a specific sum) to a specific mission project. So they go around to worldly business and beggar's winnings to raffles. And invites "everyone" to get to the raffle / auction. But God's Word says: "Every man and woman of Israel who knew that their heart prompted them to give something to the great work that the Lord through Moses had commanded to do, brought it as a freewill offering to the Lord," 2Mos 35 39. "You do well to help them on their way, so it is worthy of God. Because that for his name's sake they went off and they do not receive any help from the Gentiles, "3Joh 1: 6-7. These are quite obvious changes that have taken place, as you can not have avoided noticing, if you are awake. And then you'll also have gotten real need for the souls involved in this, and for the state of "Christendom", then you run into the presence of God in bønnenød - if you are born again. A: We are all in our natural condition at birth spiritually dead. God said that if they ate of the forbidden fruit, they would "surely die", 1MOS 2:17. B: And we are under God's condemnation - "sold under sin," until we are born again, Rooms 5:18. C: Then we also lost image of God (heart open communion with God), and getting it just left the rebirth - although it is not perfect until we are home with the Lord, 1MOS 5: 1-3. D: We have after the fall (in our relationship to God) no longer has any free will, Rooms 7:19, 9:16 etc. Our old teachers said clearly that if these main truths no longer preached, then comes all the other slipping immediately after. Likewise, they learned that "the Church (the living) stands or falls by the doctrine of justification." And so today we have a Bible deceiver. Among much else has destroyed the doctrine of justification. At funerals we hear read from the Bible: "Who can accuse those whom God has chosen? It is God who justifies "Rooms 8:33. But no one enters the kingdom of God by merely be "exonerated" from sin. No Scripture teaches that "God justifies" - puts us in Christ perfectly righteous God! "We've basically asked the devil to Council in the important question of how we reach the unsaved with the Gospel." How is this done? Here there is no question of someone who supernaturally have sought contact with demonic spirits. No, but now we have shown how this world people have come in, yes, part of the ministry invited into the wrong premises, and then eventually essentially taken over the lead of today's "established Christendom." Jesus says: "Except a man be born again, he can not see the kingdom of God," and "That which is born of the flesh is flesh, and that which is born of the Spirit is spirit", John 3: 3,6 And John says: "In this the children of God and children of the devil recognized. Whoever does not practice righteousness is not of God, neither he that loveth not his brother, "1 John 3:10. This last passage clearly shows that we have only two options: Either we are children of God, or we are children of the devil! That I was "devil" when I was but this world man, not born again - and perhaps even was an "active Christian" - sounds today most terrible. But it says therefore the word of God. And who by God's Word and Spirit see themselves as we in our flesh really is, "by nature children of wrath," Ephesians 2: 3, and then been reborn, will readily accept the designation. Whether you are children of the devil, or you are born again and become a child of God! Teaching of Scripture is indisputable ready, and always has previously also been taught and preached so. Then it's quite clear that where these ugjenfødte, thus «devil», chairman churches or mission and will assess the situation, objectives and instruments, so everything happens out of their only chance - Jesus said to "those who had believed in him ", but reacted strongly when he said that word would make them free:" You have your father the devil, and you do deeds of your father, "John 8:44. A known dr.theol., Pastor and author said to me 30 years ago: "The state of the church there have probably been so-so with through the ages. But when was the laity state another! ". Another time he told me that he had been visited by a newly saved, as when he was going asked where he would now seek fellowship. The priest asked, "How would I say?" Do you now how terrible seriousness of the situation? Do you now see the urgency, the need of the situation? Are you maybe even one that in one way or another support this world (occupant) operations in "country" (Christianity) it has added under him? Think about whether you differently, whether by direct support, or "accept him in their house," or "greet him welcome," then you are "an accomplice of his evil deeds" who "keeps alive what would die and kill what would live? 2Joh 10-11, Ezekiel 13: 17-22. Notice also the word of God that speaks so clearly: "Now I beseech you, brethren, note those who cause divisions and causes apostasy from the doctrine which ye have been taught in. Take away from them!" Room 16 17. Firstly it is clear that in both these passages is spoken not about the learning any current church or missionary preaching, but if the teaching primarily Christ, but also Paul, John and the other apostles have taught. And there say then John that they lead not this doctrine, we will not open our house for them, for example. meetings that also invites others to a proclamation that "does not bring this doctrine"! Or desire such preaching welcome in God's house. Now the situation today is quite different than when Paul wrote this. The time was the church new and vibrant. There were intruders who then created the division and was the cause of apostasy. But who is it now that "causes apostasy from the doctrine which ye have been taught," as Rooms 4:17 p.m. saying? It obviously can not be the secular world that surrounds us. They are no concrete problem to keep the apostles' teaching. No, the current terrible state, as it was in Jesus' time and time and time again later has evolved: It is Pharisees and scribes, the actual "the established Christendom" leaders, who are responsible for apostasy from apostolic teaching! We're not talking about liberal theology. It is not the biggest problem. Is a man born again, it can usually discern the devil's clear face in liberal theology. No, it is "the established Christendom" deviation from the basic truths, and human thoughts about God. Thus a proclamation without the pure teachings and God's Holy Spirit revelation of the Word. I.e. without the settled material preaching about the fall of Adam and the original sin; the imputation of Adam's sin and the righteousness of Christ - plus all the other customization Christendom today has done to this world, who gives life, and gradually kill human life in God. I myself have hitherto never said to any man that they should go out of any assembly. But in a few cases, against those who portrays a very dangerous crowd, and I even know there is such there, I've said that it's possible God wants you to sit there, sighing and pray for them, and if and when it pleases God share a testimony meeting, although the condition is that in Pergamum, Rev. 2:12 ff. But the condition in which is so serious that I've said they must actually have the knowledge of God if he wants them to remain there, if they will not go out. And we have in these and other cases have been with and slipway for God to show them where to go out or stay in the assembly. Then there are some who have told them before we knew them, after years of prayer and struggle with the question of whether they should remain in the chapel, had been peaceful to walk out of the assembly, as the only solution if they were to survive the God. What basis do they have to say this? How well do they their matches and sjelenød the matter? Are they that say such aware that those with it can withstand God, that just may be trying to save her children from the "death camp"? Jesus speaks of when he will "remove thy candlestick out of their place," Revelation 2: 5. As we see the context is precisely what he will do, if not church leader repents, then it becomes spiritual food and sustenance for the souls of the congregation. There are those who believe, those who have life in God, constitutes "candlestick," which he thus will move out from the assembly! Then we will finally mention how dangerous Christendom vocabulary has been, the wording has been remelted in worldly sake crucible. It is this world titles and wording that has consumed the church and mission: The person placed "church develops", "dance teacher." . . ! And this extends all the way into the deepest struggle for the salvation of souls, where the soul would go out of death into life. It is used the world's vocabulary, or misuse of the word have given this world non-evangelical sense of the word, so the souls of the use of the word does not come through the life of God, but is generally in Pharisaic legalism, or give up everything. We think ia the word "receive" or "receive". "You should just accept! Now we just, you and I, pray together. You just tell me after my prayer, "says care provider / preacher in the meeting or conversation. Then pray together, and concludes that "now I'll take you, Jesus. Thank now I'm saved! " So quoting preacher John 1:12: "all those who received Him, to them He gave the right to become children of God, those who believe in His name." And thus saith the preacher: "Now you have accepted Jesus, so now he says that he" gives you the right to become children of God. " But the preacher / care provider does not mention anything about the word so immediately establishes in the next verse, that "were born, not of blood, nor of the flesh, nor the will of man, but of God", v.13. For Jesus himself has said precisely in this context that "except a man be born again, one can not see the kingdom of God!" "Except you are born again, you can not see the kingdom of God," say then Jesus himself! That means you can either "see", would soon learn, the kingdom of God, as revealed in the rebirth if life here on this earth and will never reach and get to "see" the kingdom of God in heaven with God! Great revivals have begun when the question was raised: "Are you born again?" Then answered some "Yes, if only I knew it!" And the preacher / care provider said, "Go home, read your Bible during prayer to God that he must show the way in this matter! " If you are born again, then you know it! It is clear that you know you are born into this world -. And yet more clear it for you if something as big as being born of God's happened to you! A wonderful rendering of 1 John 5: 1 we have in the Bible CORosenius user: "Whoever loves him who gave birth, also loves him who is begotten of him." A similar testimony we have in 1 John 3:14 "We know that we have passed from death to life, because we love the brethren." And then it also means that we know who are our brothers and sisters in Christ! Now I cry out in love to you my distress: Turn now to God and ask him really rummage you. You have no chance to rummage yourself, consider whether you have life in God - if you are not born again. Even David, and any sincere children of God, pray the prayer we mentioned earlier: "Search me, O God, and know my heart; Try me and know my motives, see if there be any wicked way, and lead me in the way everlasting "
So he will do it. And after it is born anew, confess this openly and clearly to the Son of God glory! It happens in a moment that a man goes from death to life, but need not be perceived as something that happened "right now." It may be for a time that the Lord works with you suddenly realize that "now, in this time, it has happened to me, I am born again!" "All" will realize that something new has happened to you. And we know an open confession that one is born again, most often met with harsh words: "Are not we now longer as good Christians as you? Are you sort of become better than us now? "Although we only testify about what's happened to us, and not say a word about them - so ia Øivind Andersen also experienced it when he got life in God. When tempted many to disqualify rebirth under, and says: "I have obviously been a Christian, but has now been given a renewal." Or they say: "There've been a development, I have been watching the deeper things." Are you saying these things, then you dishonor God who "has begotten you again"! And you may be unfruitful, because you deny his alone utilities in you! I will let the most necessary for you to get to be the last thing I share with you here, what is food and that creates life, eternal! Something I could not give you before I had called out my need for what you do not have to run straight to the head out, perhaps when you are called by God, and there would never find life, eternal! Or after being born again searched society, but did find that what was living, was killed, and what was going to die, was kept alive, Ezek 13. Christendom's vocabulary is that said "been remelted in worldly sake crucible." The words are in the verdsligjorte Christian activities become so "devalued" that they have lost their evangelical salvation force, as mentioned, inter alia, This "receiving" or "receive". Now it's like something we should do this too. We will "receive" Jesus! Prior was in place, inter alia, word "Annamma" used. In it is more this' letting anything get to them "- not prevent it totally let themselves enjoy it. And in Roseniuslitteraturen used eg. that "they had not hørsammat gospel." They had not caused the Gospel come into your ear and got go unhindered further into the heart. Similarly, "because they became subject to the justice of God," Romans 10: 3. Let's move to the opposition, which often clarifies even better. In Romans 1: 5, Paul speaks of Christ, and continues: "Through him we have received grace and apostleship for obedience to the faith among all nations, to the glory of his name." First we had the apostles' get grace ", know and get experience as totally lost sinners what grace really grace is. So did the "apostleship for obedience to the faith among the Gentiles." This obedience is not obedience to all God's word, for it is a fruit. No, this obedience of faith, says Rosenius, "is the heart Annamma of the gospel." I.e. the apostles received grace and apostleship to preach the word as gospel came to people, knocking on the door of the heart, opened the door and went in and took - and kept (like an invading army) heart (fortress). It is the Word that does all this. Paul says so blessed: "Also to you the gospel come, as it is worldwide, and it is bearing fruit and growing. So it is with you since the day you heard it and knew the grace of God in truth, "Col. 1: 6. When we get a completely different experience, thus evangelical understanding of the word "receive", namely only to let the Word, the Gospel of the Son of God be allowed to take our heart. And as the result, it always happens more than at any other occurrence in this world happens by any court birth from above: it is "in honor of his (Jesus') name," as Room 1: 5 stopped. "God chose us in Christ before the foundation was laid," Eph 1: 4. There is only one selected, only one God please, just one righteous! Bow down before God and ask Him to save you, ask: "Repent me, God, and I will return!" Jer 31:18. But there is one factor I must now mention to you. There are some we can easily believe have eternal life, everything right with God. But they can not discern clearly whether a message (written or oral) of God. It turns out that has not Act requirements first received met your heart and made you "guilty before God", so do not have your repentance started right. And though you may "see" clearly both the one and the other, then you can impossible to consider a person or a message straight - when you first got to see the sinner's right totally lost, wicked creature in yourself! In "Romans message" citing Rosenius Luther says: "You can not be so in God or Christ as you would like to be, without first for yourself and toward all men being what he wants you to be. And he wants you to yourself and all people should be what you really are: sin, evil, wretched, wicked, devilish, disbelief, etc. This is the truth about you; your name, title and dignity, "by nature children of wrath," Ephesians 2: 3. And Rosenius adds, "Once you've experienced this, then you are in God's eyes it as you would be, ie, holy, pious, sincere, fair, believing, etc. For when you have become so utterly wicked and condemned in yourself as being Christ with his righteousness, dear and indispensable for you. And then his righteousness, and you are truly holy, wonderful and saved in God's eyes. This was God's great, merciful and final goal of the law. Yes, praise God for his eternal grace and the gift! " No. 1001: Priest and Bishop Per Arne Dahl really makes matters worse by opening up a practicing lesbian Hanne Marie Pedersen-Eriksen to the responsibility of the church as a priest and shepherd of the church! Priest and Bishop Per Arne Dahl really makes matters worse by opening up a practicing lesbian Hanne Marie Pedersen-Eriksen to the responsibility of the church as a priest and shepherd of the church! Priest and Bishop Per Arne Dahl ("double") is double communicating and the worst possible way. Is there anyone who should be barred from the church above all others. Then there are those people who Hanne Marie Pedersen-Eriksen who want and will have a pastoral responsibility and living in open sin, adultery and contrary to the word of God! Hanne Marie Pedersen-Eriksen wants to be a bridge between God and Satan, between sin and Christ, between darkness and light, between everything and everyone. She is far too late. There are millions of gjengiftede "believers" who have gone before and swore way. Unfortunately for her part, she is just a continuation of the road leading to the lake of fire and destruction of living a life of sin and against God's commandments and will. Jesus said it so clear that whoever loves me, keep my commandments. To believe in Jesus without being a true successor is a huge hypocrisy! Priest and Bishop Per Arne Dahl makes here the exact opposite than what God's word says in a double sense. He is adverse to her as an individual, but is open to her as a priest and shepherd. It is the opposite to what we should be. To meet gjengiftede, homosexuals, trances and others living in blatant violation of the Word of God with love, kindness and warmth is our absolute font. But opening up for such people - no matter how friendly and welcoming the people are - it's sting in striven with God's word. It is shut out people who do not live in accordance with God's word from the pulpit that is priority no. 1. You do not realize the vast majority that we need to make a difference in a person, and to hold an office, service, function or responsibility in the church of God. What also amazes me to see such people as Hanne Marie Pedersen-Eriksen, Jan Hanvold, Jan Aage Torp and others living in blatant violation of God's word. It is the confidence, brash grandeur and insolence toward others they manifest. They should be ashamed and stay as far under a soapbox it is possible to make such a miserable life they have fashioned from God's word. Hanne Marie Pedersen-Eriksen, Anders Behring Breivik and Jan Hanvold, all go on the same way scripture says. They are sinners, belongs to the evil and live in rebellion to God's word. A lesbian, a murderer and one is an adulterer and fornicator. Running out of such is the same as giving room for the evil. All these evildoers and belongs to darkness, and they will not inherit the kingdom of God and they do not belong to Christ, but is the Ondes ambassador! Who is most Norwegian? One who comes from Karmøy or Halden? I grew up in Karmøy, so far from the Swedish border as possible. But whoever comes in from Halden is as close as possible to come. Who then most Norwegian? We are just as much Norwegian, whether you are Norwegian or you are not. So it is with these people in question. Jan Hanvold is an adulterer, fornicator and a sinner. Behring Breivik a sinner and mass murderer. Hanne Marie Pedersen-Eriksen wedlock and living in sin. All are God's words definition Devil has to Father. They are sinners who are living away from God and should not have any position in the church of God. They are not "Norwegian" or Christians, therefore opening up for such people who come in from Satan's kingdom, is to open up for him! There are only two sources in the spiritual world, either God or Satan. Whether we are "Norwegian" or we are not. Whether we are believers or Christians, or we are not. Makes a person is wrong, and is not a believer. No. 1000: Jan Aage past pranks is that now I'm Norway's only secure stalker! Lies of Torp is now so easy to reveal that even a four year old can do it, apart from the police!